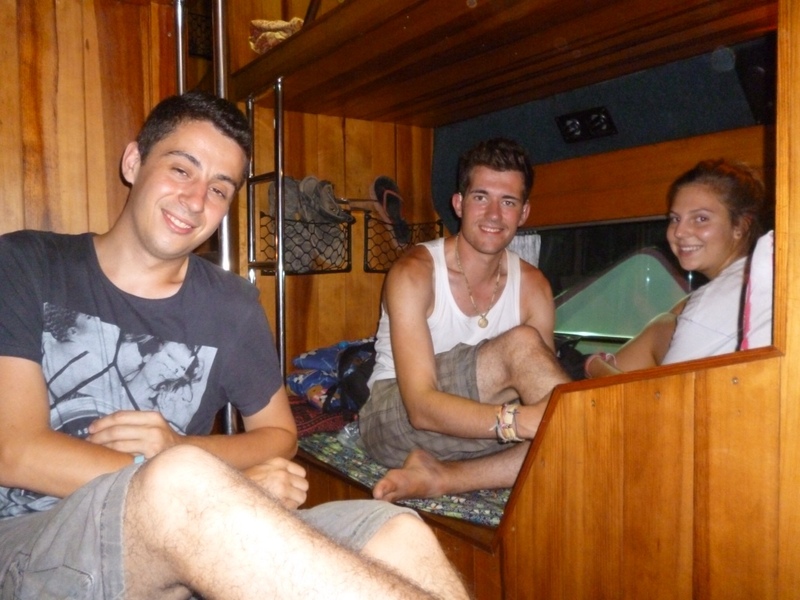 It was time to leave Vang Vieng after some tubing and caving and our booked bus to Thakek halfway down Laos loomed. The bus was billed as VIP, with aircon and came with a toilet. We (Leonie, Lauren, Alannah , Matt, Muriel and I) boarded the bus to go to Vietiene (capital of Laos) as we needed to go there first to change buses for Hanoi and Thakek. 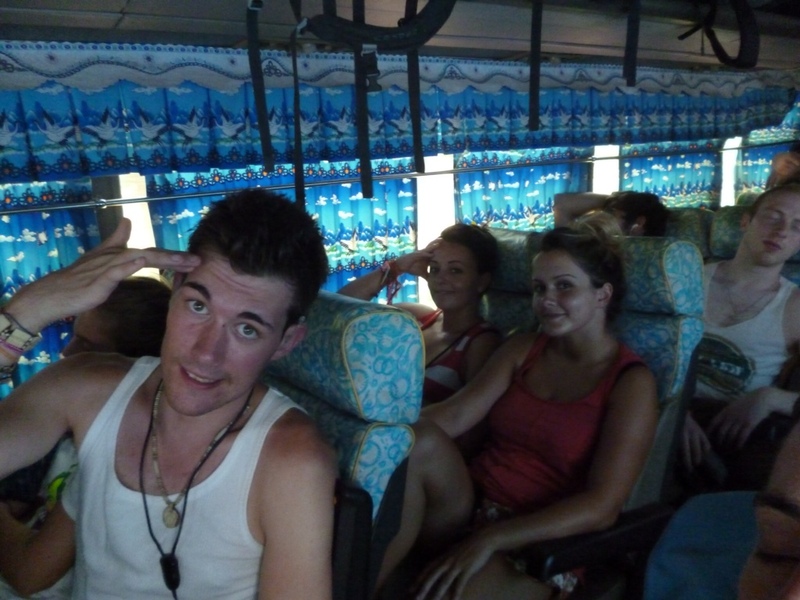 This bus was the sweatiest bus I’ve ever been on my life. Never have I left a huge body sweat imprint on the chair! The journey to Vietiene wasn’t too bad and the road fairly straight but the aircon stuttered. I sweated out my clothes so much and we were gasping for air. I looked at Lauren, sweat dribbling down my forehead as the temperature soared. We could be filling a swimming pool at this rate! I remember leaning onto to Muriel to grab my bag from under the chair and I slipped off her so quickly as both our sweat create the perfect slide. Mmmmm…nice! We mostly just slept to dream of Antarctica and talked to Alannah to remark that we could do with just a woolly jumper and a roaring fire as we were feeling quite cold. That didn’t work. 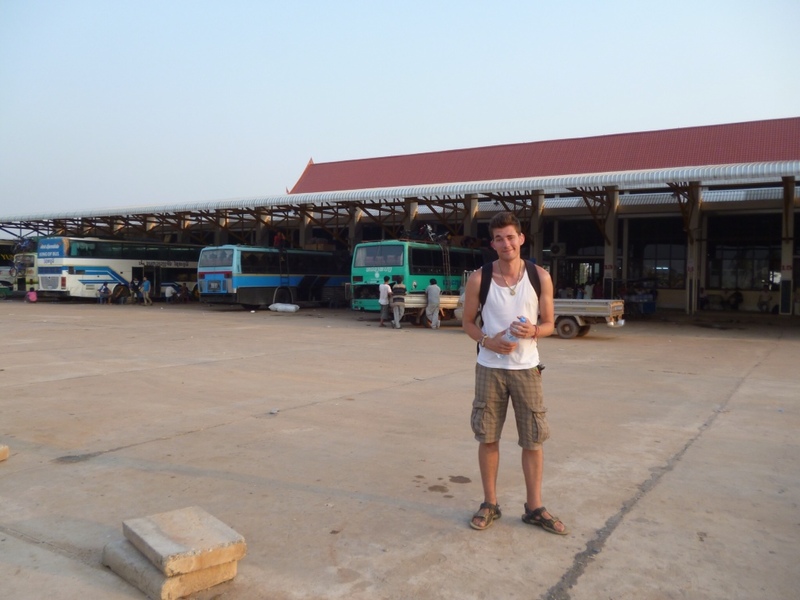 Pulling into the Vietiene Bus Station, it was time to wave goodbye to Leonie and Lauren on their way to Hanoi. I know it had been only a week together as a group but they really had made an impact on my travels and I was definitely sure to miss them. After an emotional goodbye of me standing around awkwardly and waving them saying ‘see ya later’ casually (I hate goodbyes), both of them gripped me in a bear hug and said we would be seeing each other soon as we would meet them maybe in Cambodia or South Vietnam but it was on the cards to see them. Now it was only 4 of us left! Vietiene was what I expected. Boring. Driving through it as we were getting to the bus station, I couldn’t see anything of note and I rightly agreed with the other travel bloggers who told me to skip Vietiene as a destination to stay in. Waiting an hour for our bus to Thakek, we were pleased to see that we had a sleeper bus! Check it out! The journey passed without note to Thakek and Muriel and I sharing a bed, there’s two people to a bed…we were glad to be an even number group otherwise one of us would have had to share with a complete stranger! We arrived in Thakek in the dead of the night and being do tired, we decided to stay at a guesthouse next to the bus station rather than getting a tuk tuk and drive around in the dark to a place where it might be open. Finding the guesthouse, we checked in and I was immediately appalled at the condition of it. Put it this way, when I turned on the light, a few cockroaches skittered away and one went behind my pillow. I spent an hour killing the creatures and took a shower. Still seeing cockroaches, I gave up and immediately threw my mosquito net over myself. I didn’t care it was hot. I was already sweating but only if the bugs didn’t crawl over me. I was indeed right to cover myself as Matt informed me the next morning that he help a bug crawling up his neck and when he went to slap it, the cockroaches started screaming in his ear. Ew. Imagining a place creepier than that guesthouse is a hard bargain, but lets see what your next post brings! had one and night in Vietiene and it was ok.. just!